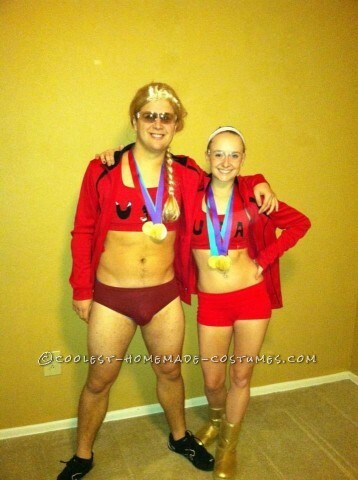 As big fans of the gold medalists, my boyfriend and I decided to honor them in the best way we know how – Halloween costumes. Jim was not hesitant at all about sporting a speedo in public, and we were a big hit at the parties we attended. We were able to get everything from Walmart for under $20/person and I made the medals by actually printing out the gold medals from the years they won (just search on Google) and matching the ribbon colors. The backs of our jackets also had “WALSH” and “MAY” on them which I just cut out of felt and simple stitched on. On our sports bras, I cut “USA” letters out of duct tape sheets and just stuck them on. Another cool fact – Kerry Walsh actually picked us as her favorite costumes of the year and sent us both autographed posters! Pretty cool to say the least. And the hair is key, too! BRAIDED ponytails, not just regular ones!